Two stars from different generations, artists of the highest calibre, mark their first collaboration with an album devoted to one of the supreme landmarks of classical music. Anne-Sophie Mutter, who in 2016 celebrated the 40th anniversary of her professional debut, and Daniil Trifonov, now in his mid-twenties, joined forces with three outstanding young string playing alumni of the Mutter Foundation at the Baden-Baden Festspielhaus in June to perform Schubert’s Piano Quintet in A major, popularly known as the “Trout” Quintet. They also explored the composer’s Notturno, a sublime late work for violin, cello and piano, and arrangements of his songs Ständchen and Ave Maria for violin and piano. The results were recorded by Deutsche Grammophon to create an album scheduled for international release on 3 November 2017. 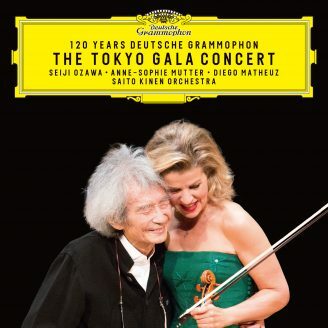 Anne-Sophie Mutter’s long-established recital partnership with Lambert Orkis is set to continue, yet she notes how she has often performed chamber music with other pianists, Alexis Weissenberg, André Previn and Yefim Bronfman among them. The opportunity to make her first recording of the “Trout” Quintet with Daniil Trifonov, she says, was too good to miss; the pianist, likewise, embraced the project with wholehearted enthusiasm. He sees Schubert, one of the great Classical composers, as an inventor of the purest melodies and a master of formal structure. The “Trout” team was completed by South Korean violist Hwayoon Lee, German cellist Maximilian Hornung and Slovakian double-bass player Roman Patkoló, all current or former scholarship students of the Anne-Sophie Mutter Foundation. “It’s inspiring to have many viewpoints, many cultural roots coming together in this collaboration,” comments Mutter. The five musicians soon found common cause as they developed their vision of Schubert’s Piano Quintet. Mutter compares the interpretative process to mountain climbing, where reaching the top of one peak reveals fresh perspectives on other, higher peaks yet to be conquered. The process of discovery, she adds, was both exciting and demanding. Differences of opinion over tempo changes within a movement and tempo relationships between movements of the “Trout” were resolved in rehearsal, allowing the players to unlock what Trifonov calls the composition’s “essence of energy”, the dramatic outbursts, sharp contrasts and bright sonorities that give the work its life. “Emotions don’t run in pale grey,” Mutter interjects before the pianist has finished his thought. Anne-Sophie Mutter pays tribute to Daniil Trifonov’s phenomenal range of tone colours and lightning-quick reactions to fresh musical thoughts. “Even after discussing everything in rehearsal, you come to different solutions in performance,” she observes. “But that only happens with musicians who are free to make music, not concerned with working from one recipe.” In addition to the “Trout”, their album contains Mischa Elman’s arrangement of Ständchen together with Ave Maria, more correctly known as Ellens Gesang III, arranged by August Wilhelmj in the 1880s and subsequently elaborated by Jascha Heifetz. Both performers made changes to their parts to create what Mutter describes as a “joint venture” in the art of arrangement. “I think there was also a little help from Liszt,” notes Trifonov, referring to the Hungarian composer-pianist’s influence on his handiwork. “Of course, arrangements are arrangements,” comments Mutter. “But one sometimes has to rearrange them to bring out the original in a better way.” Schubert’s Notturno, she observes, bears witness to the composer’s quest for new sounds in the final years of his short life. The piece, perhaps conceived as the original slow movement of the Piano Trio No.1, achieves transcendent beauty in its marriage of simple violin and cello melodies with elaborate keyboard writing.